Nelson Dawson learned enamelling from the distinguished teacher and enameller Alexander Fisher. He passed on this knowledge to his wife Edith, who was a skilled watercolourist. She went on to do most of the enamelling in their joint work. They showed their first jewellery in 1899. It was set with the subtle botanical studies that were to become so typical of their work. The flowers on this pendant are tradescantia. Enamel plaque with a floral motif in a surround of gold with three pendants. 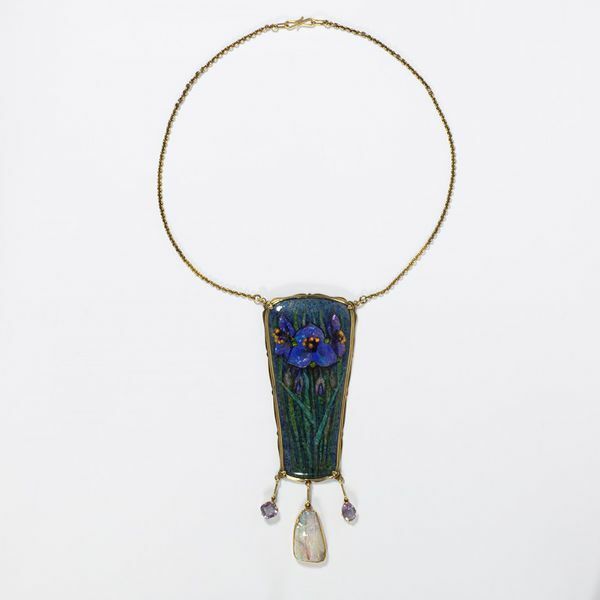 Gold and silver-gilt, set with an enamel plaque of a cluster of tradescantia and drops of opal and amethyst. The central pendant is an irregularly shaped opal, on each side are two faceted amethysts. The chain is of gold. Dated 1900. The enamel, probably by Edith Dawson, signed with the initial D enclosed by a leaf.